timeout in milliseconds when the search process for conflicting assignments will be terminated. timeout in milliseconds when the search process for cycles will be terminated. timeout in milliseconds when the calculation of the average path length will be terminated. The interview length test check the number of questions asked during the interview until a solution is reached. You may specify both, the average interview length that should not been exceeded in average and a maximum interview length that should also not been exceeded by the longest interview path. specifies the maximum interview length that should not be exceeded in average. specifies the maximum interview length that should not be exceeded for every particular solution. 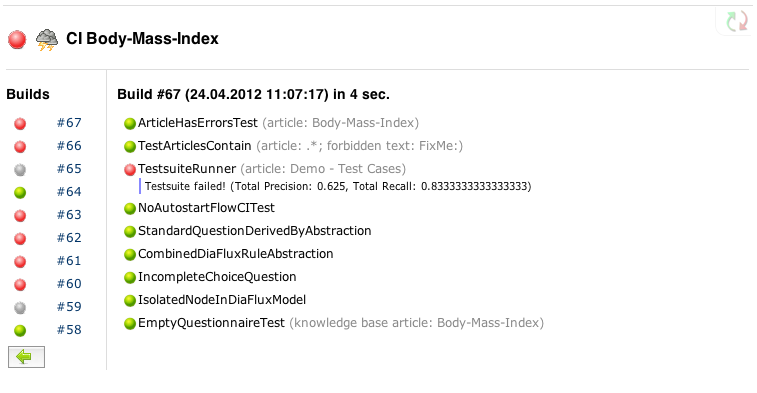 Searches all nodes in the DiaFlux models of a knowledge base that with outgoing edges does not cover all possible values. In this case the flow may stop unexpectedly in between.